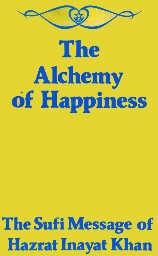 What is alchemy, what does it have to do with happiness, and why is this man with a weird name writing about it? And why did I buy all of his dozen and a half books and read them cover to cover, sometimes, like this one, multiple times? [page 12] Happiness cannot be bought or sold, nor can you give it to a person who has not got it. Happiness is your own being, your own self, that self that is the most precious thing in life. All religions, all philosophical systems, have in different forms taught man how to find it by the religious path or the mystical way; and all the wise ones have in some form or another given a method by which the individual can find that happiness for which the soul is seeking. Sage and mystics have called this process alchemy. The alchemists' search for the philosopher's stone that will turn base metals into gold was actually a search for a process that will turn an unhappy person into a happy one, rightly understood. Gold is the color of light. Humankind's search for light has led to a search for gold. Just as those who cannot afford pure gold for their jewelry have accepted base metals covered with a thin layer of gold, so those who seek for the spiritual light have accepted pure gold as a substitute, up until now. Khan summarizes it thus, "It is the longing for true gold that makes man collect the imitation of gold, ignorant that the real gold is within." [page 15] When the juice of the herb of divine love is poured on the heart, warmed by the love of his fellow-men, then that heart becomes the heart of gold, the heart that expresses what God would express. Man has not seen God, but man has then seen God in man, and when this happens, then verily everything that comes from such a man comes from God Himself. 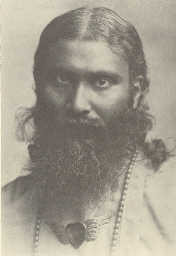 Hazrat Inayat Khan was a Cambridge educated Sufi who spoke and wrote flawless English, and his writings contain a well of spirituality whose depths have never been plumbed. It is a well to which I returned for nourishment many times on my journey, and I am here returned to this refreshing oasis and pleased to be able to share it with you, dear Readers. If you are thirsty for something in your life, stay awhile and drink of the refreshing draughts of life-giving water that we will dip together in the shade of these stately palms. It is quiet here, sit awhile. Enjoy the peace. [page 18] In order to find peace one leaves one's environment which troubles one, one wants to get away from people, one wants to sit quietly and rest. But he who is not ready for that peace would not find it even if he went to the caves of the Himalayas, away from the whole. At the time that I first read the above quote, I had a friend in my life who was planning to leave for a cave in the Himalayas, and I shared that quote with him. I looked at the large one bedroom apartment he was living in with a high ceiling and loft and said, "This could be your Himalayan cave in which you could find peace." [page 29] Animals and birds all experience peace, but not mankind, for man is the robber of his own peace. . . . Man lives in a continual turmoil, in a restless condition, and in order to seek for peace he seeks war; if this goes on we shall not have peace till every individual begins to seek peace within himself first. On page 35 he tells the story of a young robber who went to a sage for a blessing. When the sage asked what his occupation was, he said he was an unimportant robber. The sage gave him his blessing and the robber went out and was more successful than before. When the robber returned the sage complimented him on his success and said, "I am not yet satisfied with your work." So the young robber went out and recruited accomplices and was more successful than ever before. Always when he returned the sage suggested that he ought to form a larger group of robbers. Finally the sage suggested that the young man take his small army and push out the Moghul invaders from their country. The young man was on his way to becoming the head of an empire. Had the sage told the young man to get a job in a factory, the Moghuls might have remained indefinitely. One cannot nurture in someone else something that does not have a seed planted already. With that seed one can be a criminal or a king. When one meets a river in one's path, one can sink to one's doom, swim across, or walk across the top of the water. This is the lesson of the miracle of Christ walking upon the water. [page 38] Those who are drowned in life's misery are those who cannot get out of it; they are tied down in the depths of life; they cannot get out and they are miserable there; they are the ones who sink. Then there are others who are swimming; they are those who strive through the conflicting conditions of life in order some day to reach the shore. There are, however, others who walk upon life. Theirs is the life which is symbolically expressed in the miracle of Christ walking upon the water. It is like living in the world and not being of the world, touching the world and not being touched by it. A lot of words have been thrown at the subject: What is art? Is it our attempt to imitate nature? To make something beautiful? Obviously there is no one answer as some art resembles nothing found in nature, and some art is distinctively not beautiful. So, what is art? [page 44] Some believe art is inferior to nature. But that is not so. Art completes nature; in art there is something divine, for it is God Himself who through man completes the beauty of nature, and this is called art. In other words, art is not only an imitation of nature, art is an improvement upon nature, be it painting, drawing, poetry, or music. But the best of all arts is the art of personality. When we came into our present body, we brought our individuality, our immortal "I", with us. In this lifetime, this individuality has a personality to develop. "Personality is an improvement on individuality," Khan says. As we are each an evolving individual, our evolution involves the shaping of our personality. And, like anything else we craft with our hands, the final product will testify to our care and skill. People can decide whether to become a painter or a poet, a musician or a sculptor, but everyone has a personality and, like it or not, is engaged in a work of art that all can see in one's personality. Given the choice of a spouse with a beautiful face or a beautiful personality, many choose the former to their lasting regret. It is the differences we find in people that make the world interesting. And yet we live in a world in which the founding principles of democracy seems to be "everyone is equal". [page 47] It seems a very kind idea that everybody is equal; but when you tune the piano with all the notes at the same pitch there is no more music. This wrong conception of democracy is like tuning the whole piano to the same note; then the music of the soul becomes dull. It is more an obsession with democracy than democracy itself. Real democracy is raising oneself to a higher ideal . . . of being equal on a higher plane instead of being ignorant. "When the spirit of aristocracy has evolved sufficiently, it becomes democracy. Then the person thinks, 'I am the equal of any person in the world; there is no person lower than I'. But if a person says, 'There is no person higher than I', that is not democracy." (page 55) Those who noisily proclaim the virtues of democracy to any who will listen should heed the following advice of Khan, "Silence raises the dignity of the wise and hides the stupidity of the foolish." By learning silence, one may come to learn gentleness, that attribute that Khan calls the first step to the art of personality. [page 48] Gentleness is the greatest power of all. Gentleness is like the power of water: water is purifying, and if there is a rock in the path of a stream of water it will surround the rock; it will not break it, for water is pliable, and so is the one who is gentle. Gentleness in the long run will always purify everything. Once he was on a train next to a soldier, and trying to find some commonality in their diverse views, Khan told him, "Well, we are brothers!" and when the military officer was severely offended by such a thought, Khan quickly responded, "I forgot. I am your servant, Sir." He tells us, "The foolishness of the man blazed like fire; I put water on it and extinguished it. I did not diminish myself; we are all servants of one another; and it pleased and satisfied him." The next story (page 50) sounds like a maneuver that the famous hypnotherapist Milton Erickson could have done. A woman came to Khan and complained that every day when her husband comes home from work, they have a quarrel. Khan responded by giving her some candy mints he called "magnetized sweets"; he instructed her to keep them in her mouth the moment her husband came home every day. After ten days she returned for more of those marvelous "magnetized sweets," that had returned harmony to her and her spouse's lives. What did the trick was that she was unable to talk when her husband came home because of the magnetized sweets in her mouth. He was able to get himself back in tune and harmony returned to their lives. There are those who extol self-effacement as a virtue - they should hear what Khan has to say about that. "When the individual has no personality he can annihilate nothing; there must be something first. If a person started in life with self-effacement he would never become a self. What would he efface? Effacing comes afterwards. First he must be a self, a real self that is worth being." To efface is to rub out, to eliminate one's self, like what Khan did with the soldier when he said, "I am your servant, Sir." To make light of a tense situation often involves self-effacement, as the tenseness stems from one or both parties heavily involved in their selfhood. For that reason humor is an excellent tool for reducing tension and bringing both parties to harmony. [page 58] What Omar Khayaám has called wine is the amusement one gets by looking at the phenomena of life, which lifts one above the worries of life. One will always find that the most evolved sages can be amused; that is why they are pleasant to meet and to speak to. Worrying comes from self-pity and fear; and fear is made of the clouds of ignorance; the light will dissolve it. Humour is the sign of light; when the light from above touches the mind it tickles the mind, and it is the tickling of mind which produces humour. Khan tells that fear is like a red lantern that shine on all we see and everything it shines on becomes red and frightens us. It was this insight that led Franklin Delano Roosevelt to proclaim that, "The only thing we have to fear is fear itself." Where does this fear come from? [page 64] All one says, does, and thinks comes from an impulse; one end of it is in ones' own mind and the other end is in the mind of God. If you think about it, God is like a communication plenum or nexus where everyone is connected to everyone else. In a football stadium a few years ago, several people reported getting sick and the authorities discovered the problem was some bad soda. They announced over the PA system for people to stop drinking the bad soda. Within minutes three hundred others became sick. An epidemic was on hand apparently. The authorities did a closer inspection on the soda and found out it was wasn't the soda after all. They made that announcement and all the three hundred suddenly began to feel well again. The very process of fear can create the thing feared. We are all interconnected to each other through God, who gave us an individuality, an "I", by means of which we can receive the light to dispel the fear, but it requires an effort on our part. That effort on the part of our "I" in this lifetime we call personality. [page 67] If one is afraid of someone who may harm one, then one inspires that person to do harm. If one distrusts someone, and thinks that one day that person will deceive one, he will certainly be inspired to do so; but if one has trust, the power of that trust may some day turn even an enemy into a friend. Back on page 20, Khan said, "In reality the soul is not mortal, but if the soul believes in mortality it is just like being mortal." Attitude is supreme in the realm of the spirit world. Khan likens our attitude to a ticket to a train that we must show at the gate. The conductors don't care about one's occupation or ancestors, they simply say, "Ticket please!" and if we have the ticket we get aboard. What is a flood but a river that has moved out of its channel? "Attitude," Khan says, "forms a channel for effort, and a right attitude makes a channel for a right effort." (page 70) And that right attitude must extend in time so that one does not lose patience before the desirable condition is brought about. We are like the "string of an instrument tied at both ends; one is the finite and the other the infinite." If we are conscious of the finite, we are tuned to the finite, and we will be weak, limited, and powerless. Having the right attitude Khan likens to being tuned to the infinite, which will pull us through the trials and tribulations of life. In the world of egos, Khan says, "There is a sword in every hand, both in that of the friend and in that of the enemy. The friend kisses before he strikes; there is no other difference." One might call this the struggle of life, the battle of egos. [page 90] Struggling with oneself is like singing without an accompaniment. Struggling with others is the definition of war, struggling with oneself is the definition of peace. Why must life be a struggle? If we do not struggle with the river, we are carried downstream; only if we struggle can we reach the safe harbor of the shore. Khan says that his murshid (teacher) gave him this verse, "When I feel that now I can make peace with my self, it finds time to prepare another attack." [page 94] That is our condition. We think that our little faults, since they are small, are of no consequence; or we do not even think of them at all. But every little fault is a flag for the little self, for its own dominion. In this way battling makes man the sovereign of the kingdom of God. Very few can realize the great power in battling with and conquering the self. The psychological process of projection is so pervasive that it escapes our attention most of the time. And yet, every time that some does something that we dislike intensely, it is as if our sovereign becomes angry because it is reminded of the petty suzerain, the little ego in us, who behaves in the same manner in other contexts. I call that the "mirror whammy" and I remember well the first time that I encountered it. During one of my first computer jobs, I was chatting during a break with colleague named Gary. The big show on television at the time was "Lost in Space" and it featured this whiny Dr. Smith. I was telling Gary how much I disliked this man's constant whining. Gary looked at me and said, "Sometimes the one who vexes us is our greatest teacher." I was aghast! How could this miserable creature have anything to teach me, much less be doing something that I was doing out of my awareness. My utter shock was a definite signal to me, one that I could not mistake, that there must be some truth in what Gary told me. I had been paralyzed in mid-sentence by the mirror whammy! After that wake up call I began to observe the mirror whammy at work in myself and others, e.g., one day, Mary Worth in her comic strip expressed the very strong opinion, "I abhor opinionated people!" When I found this next passage by Khan, I recognized that he was talking about the same process. [page 95] When we blame another person, when we dislike somebody, we overlook the same element in ourselves. There is no soul in the world who can say, 'I have not this in me'. . . . For instance the little child cannot help loving. If a thief comes, or a robber, the child wants to love him and smiles at him. The child is from heaven, the thief is from earth. There is no place for him there; that is why he is no thief to the child. Where is this "heaven" that Khan talks of? [page 96] It is in the heart of man. As soon as one begins to consider the feelings of another, one begins to worship God. One might say that it is difficult to please everyone. No doubt it is. It is more difficult still if one has in oneself the inclination to please everyone. This is a delicate distinction. How does one please everyone and maintain one's equanimity? One doesn't please everyone, is the short answer. But that calls for another story. In this one the murshid with his mureeds (pupils) arrived at a village peasant's home where the peasant had enthusiastically prepared a great sumptuous meal for the travelers. All of the travelers, murshid and mureeds had take a vow of fasting, and yet the murshid sat down and ate with relish. The mureeds thought all kinds of bad thoughts about their teacher. [page 96] After dinner was over and they went out the pupils asked, 'Did you not forget the vow of fasting?' 'No,' was the murshid's answer, 'I had not forgotten. But I preferred breaking the fast rather than the heart of that man who with all his enthusiasm had prepared the food.' . . . God is love; and the best form of love is to be conscientious regarding the feelings of those with whom we come in contact in everyday life. There is a wonderful episode in the original Star Trek series in which a huge asteroid-sized ship has the Enterprise star ship in its thrall and has given it an ultimatum to surrender in ten minutes or be blasted into space dust. Spock has checked the data and found no way to escape their fate. The engineer Scotty cannot generate enough thrust to pull free. The doctor McCoy is standing by helpless. They look puzzled when Captain Kirk announces to the alien commander that they have a cache of Corbomite aboard. This Corbomite has the effect of deflecting back any force directed at them and increasing the force. To Kirk, it was a bluff, but its effect was to cause the alien vessel to release the Enterprise. If they had resisted the alien ship, they would have been destroyed by its overwhelming firepower, but instead Kirk used the "Corbomite Maneuver." [page 102] There is the word of the Bible, 'Resist not evil'. Sometimes evil will come like fire thrown by a person into the mind of another. A fire then starts in that mind which had been without it, and in reaction it too expresses the fire. To resist evil is to send fire in answer to fire; in other words to partake of the fire that comes from another. But by not partaking of it one casts the fire out and the fire falls on the person who threw it. There was a popular song. You know what a popular song is - it's a song that expresses a condition that is prevalent in society and so many people identify with it and buy copies of it that it takes on the title "popular song". This song I'm thinking of had a line in it, "You left me just when I needed you most." If we understand that "needing" was a process that the partner didn't like, it's easy to see how the separation happened at the peak of the needing. But look at this aspect of the situation: the ending of the relationship was the worst time of all in the relationship. Both of them allowed the needing to become increasingly bad in the present and neither liked it. Khan reminds us that our present will be our future, what we do in the present will be increased in the future. Unless we find a way to eliminate such processes as "needing" and harmonize our life in the present, the future will be even bleaker for us than the present. To "need" someone is wish to have the other person provide for us what we are not willing to provide for ourselves. To make our end the best experience of all we must take a step in the right direction each of moment in our present. [page 125] The most essential thing, therefore, is to harmonize in such a way that by centralizing our thought within ourselves, by finding our real self, the future may become harmonized. There is a prayer in the East: 'We thank Thee, God, for all we have experienced; the only thing we ask is make our end the best experience of all." When I studied NLP back in the 1970s I learned a process for removing phobias from people and ourselves. It was simple quick and easy and I enjoyed practicing my new process. Then one day, I heard Richard Bandler say that it was possible to run the process backwards and install a phobia. As I puzzled about how to do such a thing, he told me, "But there are experts out there all over installing phobias all the time, who don't even know they're doing it. Now you have the tools to notice when they do it." That just heaped bafflement on top of puzzlement for me, but slowly over time, I became aware of the phobia-mongers as I came to call them. They are people who tell you things in such a way that if you felt happy before, you no longer feel happy afterwards, and you can carry this unhappiness around with you for weeks or years. In this next passage Khan calls them "robbers". [page 159] The robbers who go into other people's houses to steal are few in number, but there are many robbers of happiness, and they seldom know that they are robbing others of their happiness. The robber of happiness is more foolish than the robbers who go after wealth, for when they are successful they at least get something; but the robber of happiness never gets anything. He only gives sorrow to others. This next story is about a robber and about a man who learned about trust. Khan says that an important step on the spiritual path is to learn to trust and trust really deeply. [page 164] There is a story of a great Sufi who in his early life was a robber. Once there was a man traveling through the desert in a caravan and he had a purse full of coins. He wanted to entrust them to someone because he heard that robbers were about. He looked around and some way off he saw a tent, and a man was sitting there, a most distinguished looking man. So he said, "Will you please keep this purse, for I am afraid that if the robbers come they will take it." The man said, "Give it to me, I will keep it." When the traveler came back to the caravan he found that robbers had come and taken all the money of his fellow-travelers, and he thanked God that he had given his purse to someone to keep. But when he returned to that tent he saw all the robbers sitting there and among them was this most dignified man dividing the spoils. He realized that this was the chief of the robbers and thought, "I was more foolish than all the others, for I gave my money to a thief! Who can be more foolish than that!" And he was frightened and backed away. But as soon as the thief saw him he called to him and said, "Why are you going, why did you come here?" He said, "I came here to get my purse back, but I found that I had given it to the very band from which I wanted to protect it". The chief said, "You gave me your purse, is it not so? You entrusted it to me, and it was not stolen from you. Did you not trust me? How can you expect me to take it from you? Here is your purse, take it." This act of trustworthiness impressed the robbers so much that they followed the example of their chief. They gave up robbery. It moved them to the depths of their hearts to feel what trust means. And in his later days this chief accomplished great spiritual work. This shows that by distrusting people we perhaps avoid a little loss, but the distrust that we have sown in our heart is a still greater loss. When I was young I thought like a child and acted like a child. I was sure of myself and my opinions and ready to share them with anyone who would listen. As I grew older I learned and became a little wiser with the effect that I became less sure of myself and less likely to afflict my opinions on others. I had learned that my opinions could change with the advent of new knowledge and all I could really say is, "This is the way I feel about the matter, up until now." Every moment brings me the possibility of a change of opinion that can wash away a lifetime of wrongly held opinions. To complete St. Paul's thought, "When I grew up, I put away my childish things." [page 190] The foolish man is ready to teach you without a moment's thought, ready to correct you, ready to judge you, ready to form an opinion about you. But the wiser a man is the more diffident he is to form an opinion about you, to judge you, to correct you. What does this mean? It means that whatever man possesses in a small degree he thinks he has much of, but when he possesses more he begins to feel the need and the desire for perfection, for completion. I remember a story about a learned professor from a Western university who went to China and expressed an interest in learning about the culture of the region. He was invited to a tea ceremony by an Eastern sage. The old Chinese man poured the tea into the professor's cup and when it reached the brim, he kept pouring, pouring, the tea filled the saucer, and he kept pouring. The hot tea spilled from the saucer and scalded the professor's hand and he yelled, "Stop! Can't you see the cup's full already?" The sage looked at him and said, "Yes. One cannot pour more tea into an already full cup, can one?" The professor had brought his thoughts and his opinions like a full tea cup into the meeting with the sage and there was no room for the learning for which he claimed to be searching. He needed the empty cup of a beginner, of a child, to have a chance to receive some new tea from the sage. Maybe the professor learned a lesson. Maybe he didn't. Life gives us lessons, but we must do the homework. There is a flip side to the already full cup, and that is the cup that can never be filled. The heart of man is the cup that can never be filled. The Western professor in the first cup story had closed off his heart -- he had imagined that he knew the right way to learn new things -- the oriental sage's teachings could find no place in his heart. Thus the tea overflowed because of the blocked off heart. The overflowing teacup gave the professor an image in his external world of his internal world, the blockage in his heart, and the effect it would have on his ability to learn anything truly new. What had the power to block up, to fill his heart was not truth, but fact - which is but the shadow of truth. [page 193] There is a great difference between fact and truth. Fact is a shadow of truth. Fact is intelligible; but truth is beyond comprehension, for truth is unlimited. Facts are based on words, and words that describe facts are subject to interpretation and disagreement. To some the words of the Bible describe facts, and these facts some people interpret differently than others and this leads to disputes between religions. Words are maps, and Alfred O. Korzybski said that "the map is not the territory, it cannot represent all the territory." Truth cannot be contained by words. The fish of truth will always slip through the seine net of words. Hazrat Inayat Khan, a Sufi, tells us how Sufism holds words. [page 197] Sufism avoids words, words from which differences and distinctions arise. Words can never express the truth fully. Words promote argument. All the differences between religions are differences of words. A famous bandleader of the 20th Century was Lawrence Welk. On his weekly television show, he started off every musical number of his orchestra with these words, "Uh ONE and Uh two!" A strong accent followed by a weak accent. Power without knowledge is dangerous; knowledge without power is useless. How does one avoid both of these dead ends? [page 203] What one should do is this: if one takes one step in power, one should take another step in knowledge, and then there will be balance, then one's life becomes rhythmic. Just like the accent in musical two-four time: there is the strong accent, and then comes a weak accent. Now there is power, then there is thinking. One develops one day in knowledge, one day in power, and from this rhythmic pacing from day to day, one comes to know one's object in life and becomes steadfast its attainment. Only then does one become dependable. People who are undependable are like a branch that moves in the slightest breeze. Khan says, "Even the birds are frightened to sit upon a moving branch." (page 205) An example of an undependable or moving branch is a mass belief. In one year the Czar of Russia was held in high esteem, in the next year he was executed and all symbols of his reigns were trod underfoot. It is always a short step from mass belief to mass mischief. Mass belief is the first step in belief according to Khan. It is a moving branch. The next step is the belief in authority. Another moving branch. The next higher step is the belief in reason. "This, however, also has its limitation. Since reason is the slave of the mind, reason is as changeable as the weather; reason obeys our impressions." Also a moving branch. The fourth belief is the highest belief - that belief which is conviction so that nothing can ever change it. [page 212] When there is no conviction there is nothing. The secret of healing, the mystery of evolving, the power of all attainment, and the way to spiritual realization, all come from strengthening of that belief which is a conviction, so that nothing can ever change it. Have you ever tried to light a fire in a forest using a flint? No matter how many or how large a spark you create the tinder never seems to catch fire for more than an instant. But if you create a sizable spark and blow as hard as you can, and keep blowing soon you will have a warm and blazing fire. Conviction is like that nourishing breath when it is poured upon an idea. [page 234] And if he will keep this idea before him and blow on the spark of mastery by constant contemplation, then one day that flame will rise and his life will become clear and his power will indeed be great. I didn't grow up with any models for making business deals. My parents were blue collar workers and never got into any retailing business. As a result I was always looking for something free, some way to get more out of a deal than the other person did. I was missing an essential point, the essential point of a good business deal -- both parties to the deal must profit. In Khan's words, it is in accordance with the law of reciprocity that each must give more than they take from any deal. Does this seem impractical to you? If it does, it is because of a certain danger that may lurk within you. [page 238] The danger in this law is that a person may value most what he himself does and may diminish the value of what is done by another. But the one who gives more than he takes is progressing to the next grade. We are taught a standard of cleanliness and hygiene by parents, teachers, and friends and we strive to follow those guidelines in our lives. Wouldn't it be nice to have a similar standard of inner purity so that we may recognize truth when we encounter it? Khan gives us one. [page 243] There is, however, a standard of inner purity of which the principle is that anything in speech or action which causes fear, brings confusion, or gives a tendency to deception, extinguishes that little spark in the heart, the spark of trueness which only shines when the life is natural and pure. An obsessive concern for external cleanness is the projection of or sign of inner uncleanness, and the end result is illness. [page 244] For all harsh judgments and bitterness towards others are like poison; to feel them is exactly the same as absorbing poison in the blood: the result must be disease. First disease in the inner life only, but in time the disease breaks out in the physical life; and these are illnesses which cannot be cured. External cleanliness does not have much effect upon the inner purity; but inner uncleanness causes disease both inwardly and outwardly. About halfway through this review my wife and copy editor, Del, read what I'd written and said, "I really like how you've strung these together." "Yes," I said, "like a string of pearls." A string of pearls in which I merely selected the pearls and provided the string. And now I'm ready to complete the journey by attaching the end to the beginning of the string of pearls. Life is like that string of pearls, eventually it closes the circle and attaches the end to the beginning. Rumi has just described my life. I left my native state of Louisiana and roamed about from coast to coast and was pleased with everything I saw. But there came a moment when, like that reed, I felt a crying need to return to my native soil, to re-attach myself to the earth from which I sprouted. Where are you in your journey, dear Reader? Are you still roaming about, pleased with all you see? Have you started thinking about a return home? Are you the artist who paints the plan you have laid out in your mind? Or are you the artist who takes suggestions from the painting as you go on painting? Listen to the music of the flute that is your individuality as you string the pearls of your life together. These are the jewels that no matter where you carry them with you in this world will accompany you into the next world in freedom and light.